Minnesota lost treasure sites are listed on this page. However, I cannot promise that this information is completely accurate. As treasure tales go, because they have been passed down through many years, certain elements of the lost treasure story may have been altered, either intentionally or otherwise. Good luck! And have fun in your search for Minnesota treasure. Located on the Mississippi River approximately one mile east of Grand Rapids. This old town burned in the late 1800's. Treasures and personnal items have been located by treasure hunters. Located at the mouth of Otter Tail River. In 1875 this town was abandoned. Treasures or small caches may be buried here. Located on the South Fork of Two Rivers, between Greenbush and Karlstad. This town was also abandoned years ago. 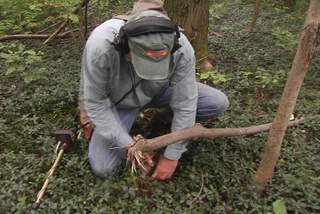 Search for buried caches and lost personnal items. Located approximately eight miles east of Roseau. Salol was at one time a rich lumber town. Many lumberjacks hid their pay. Search here for small caches and lost or dropped personnal items. Located across from Pembina, in Kittson County. Treasures have been found on the western banks of the Red River near Noyes. The treasures may have been from the wrecks of riverboats that crashed in this area. Located on State Rte 10. In the late 1800's a treasure of gold and silver coins were buried by outlaws, west of Wadena. The outlaws were then killed by a posse. Located on County rte 30. Somewhere near Pipestone, Jesse James buried $55,000 in gold coins and bullion. Minnesota lost treasures may be located in ghost towns.